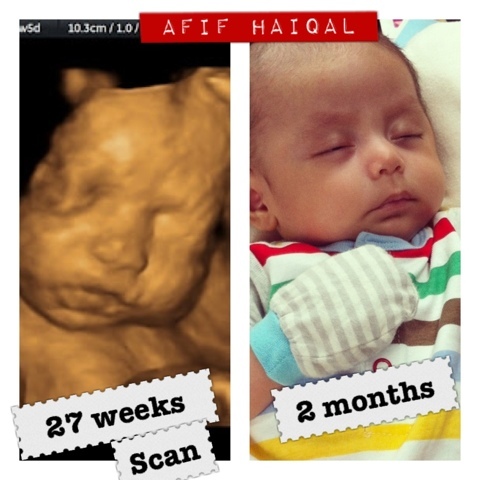 Remember this post where i babbled about Afif's 3D/4D scan? i can't believe how same he looks in and out of the womb! 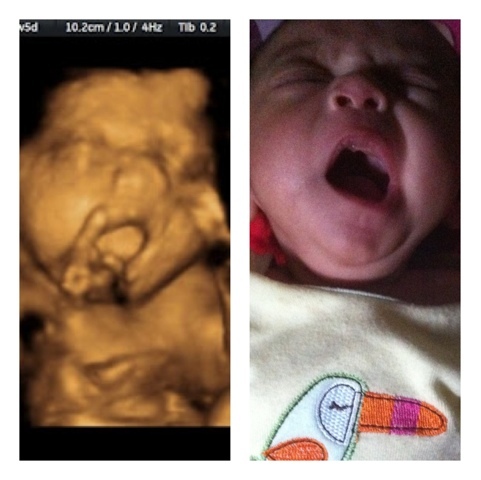 It's seems like it's only yesterday that i am heavily pregnant with him. Seeing my tummy move dan senget sebelah. Feeling his hiccups twice a day. Not feeling alone because i know that i have him inside of me all the time. His kicks and punches as if to remind me "i'm here mama!". Now dah keluar budaknya. Nak dekat 3 bulan pon haa umurnya. Sometimes i look at him and say "It's YOU that was in there.. Ini rupanya budak kuat menendang ni.."
The next thing i know, he'll be running around the house, going off to school, leaving me for boarding school, off to university across the sea, getting married..
What i'm trying to say that, i have came to a realization that people grow. This baby in my arms will grow up. He won't stay little and pure. He won't be my baby forever. Now i'm his everything, i'm his favorite person in the whole wide world. There will come a day that he would not need me anymore. Before that day come, i'm gonna cherish every single moment we share. Kissing him like there's no tomorrow. Hugging him til it feels like i'm gonna crush him. Telling him stories about his mom and dad, atoks and neneks, and everything he wants to know. Because the dreaded day will come when he's too grown up to run back to mama's ketiak. When i'll no longer be there for him..